What is the University Outreach Program? The University Outreach Program is an expansion of the Gottman Method Couples Therapy core clinical training program, designed to make Level 1 Clinical Training and Level 2 Clinical Training accessible and affordable to master’s and doctoral level university students by helping universities offer the trainings on their campus. These group video trainings are commonly held as proctored, two-day (Level 1) or four-day (Level 2) weekend workshops at a university location, or are integrated into an existing class curriculum. As hosts of the program, you will receive free access to training films, be able to provide training manuals to your students at a discounted University Outreach Program price, and facilitate a free Q&A session with one of our highly experienced Certified Gottman Therapists. Level 1 Clinical Training will give participants new insights into treatment for couples who struggle, using research-based assessments and effective interventions based on the Sound Relationship House Theory. For more information on the Level 1 content and curriculum, click here. Level 2 Clinical Training will help participants integrate and internalize the Gottman Method Couples therapy and expand upon assessments and interventions taught in Level 1. Participants are required to complete Level 1 Clinical Training before moving on to Level 2 Clinical Training. We strongly recommend this training only be offered to participants who are in the clinical phase of their degree and already seeing clients so they can begin implementing and practicing Gottman Method techniques immediately. For more information on the Level 2 content and curriculum, click here. Students and professors alike will receive great benefit from this program. Offering a Level 1 or Level 2 Clinical Training will increase the intellectual value of your curriculum and diversify the coursework offered to your students. Read a student perspective on the impact of the UOP here. Upon completion of the full course, students will receive their Gottman Level 1 or Level 2 Clinical Training Certificate of Completion. The Level 1 and Level 2 Clinical Trainings are eligible for continuing education credits, for an additional $29.99 (Level 1) and $39.99 (Level 2) processing fee to be paid to PESI Inc. Note: While we do not limit the registration to currently enrolled students, we have created this special program to reach students, faculty, alumni, and others closely involved with universities. In order to host a program at your university, we require a minimum of 10 participants. 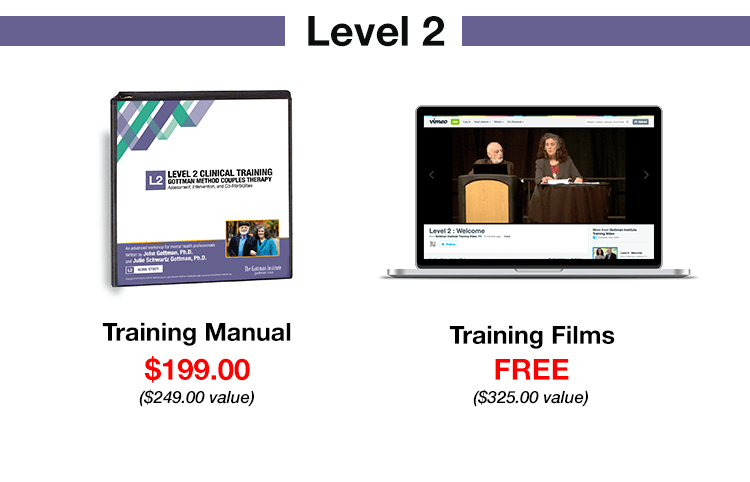 Exclusive streaming access to the Level 1 Clinical Training films ($200 retail value) at no cost to the university. The 300-page Level 1 Clinical Training manual for each participant at a discounted University Outreach Program rate of $125 ($150 retail value). Each participant is required to have their own manual so they can refer to and use the Assessment Questionnaires and Clinical Interventions following the training. Marketing materials and email copy to promote your University Outreach Program trainings to your students, staff, and alumni. A one-hour question and answer session with a Certified Gottman Therapist through video or phone call. A detailed, step-by-step proctoring guide (preview it here). 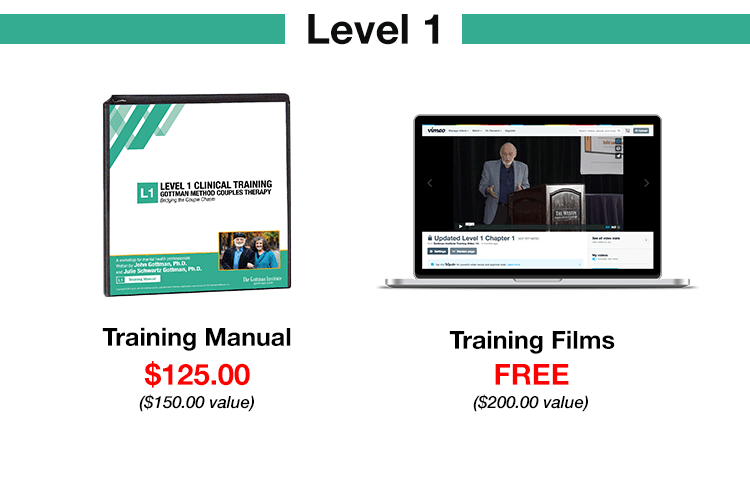 Exclusive streaming access to the Gottman Level 2 Clinical Training films ($325 retail value) at no cost to the university. The 500-page Level 2 Clinical Training Manual for each participant at a discounted University Outreach Program rate of $199 ($249 retail value). Each participant is required to have their own manual so they can refer to and use the Assessment Questionnaires and Clinical Interventions following the training. 10 role-plays integrated into the video and manual curriculum to help participants deepen their understanding and practice implementing Gottman Method Couples Therapy. Two one-hour question and answer sessions with a Certified Gottman Therapist through video or phone call. You let us know you’re interested. Once you have contacted The Gottman Institute (TGI) and expressed interest in proctoring a Level 1 or Level 2 Clinical Training for your students, we will request further information from you and provide a University Outreach Program Letter of Agreement to be signed that includes the dates you wish to host your training. The Letter of Agreement will serve as the program’s formal contractual agreement between the participating university and TGI. The 11-hour (Level 1) or 28-hour (Level 2) streaming video training can be scheduled according to your convenience. For example, it can be proctored as a two-day (Level 1) or four-day (Level 2) weekend workshop, over the course of multiple weekends, or over the course of the academic quarter or semester. A two-day (Level 1) or four-day (Level 2) intensive weekend workshop is recommended. The dates you chose will be integrated into your Letter of Agreement. You advertise the event to students and alumni. It is your responsibility to advertise the event and manage registrations. All trainings require a minimum of 10 participants. We will provide marketing resources to assist your outreach efforts. We recommend a student registration fee of $125 per student for Level 1 ($350 retail value) and $199 per student for Level 2 ($575 retail value), which covers the cost of the training manual. We provide online streaming access to clinical training films. We will provide you with exclusive online access the the complete set of Level 1 ($150 value) & Level 2 ($325 value) Clinical Training films at no cost. You will be granted a time limited membership with login credentials, which will be activated starting two weeks prior to the start date of the training and remain active for one week following the end date of the training. This protocol will be explicitly outlined in the Letter of Agreement. You submit an order for clinical training manuals. We will provide Level 1 and Level 2 Clinical Training manuals for each University Outreach Program participant at a discounted student rate of $125 ($150 retail value) for Level 1 or $199 ($249 retail value) for Level 2. You will order their manuals through TGI two weeks prior to the training. We print and deliver the clinical training manuals. We will coordinate the printing and delivery of the clinical training manuals order and will send an invoice to you directly. Payment will be due 30 days following the completion of the training. Students pay the proctor or university, and we accept one payment per training either by check or credit card. You host a proctored training. You will provide an appropriate venue and proctor for the training. The proctor’s responsibilities are to distribute clinical training manuals, oversee the registration and sign-in sheets, monitor the schedule of the workshop, and run the clinical training films. The proctor must agree to abide by the terms in the Letter of Agreement. To ensure that the integrity of the material is maintained, proctors are not to answer clinical content-related questions posed by students and will direct all questions regarding Gottman Couples Method Therapy to the Q&A session with a Certified Gottman Therapist (CGT) or to The Gottman Institute. We send you certificates of completion. Once we receive sign-in sheets from the proctor, we send certificates of completion to those participants who signed in to each training session. Continuing Education credits are offered separately at an additional cost.